I won’t beat about the bush. There’s a lot of crap spoken about food and wine matching. On the one hand, there are people who stick doggedly to rules. No red wine with fish. No white wine with beef. Ever. No matter what cut, or how it’s served. In turn, this causes the polar opposite. Drink what you want, all food and wine matching is rubbish. I’m not going to argue with the drink what you want bit. Why drink something you don’t like? But if you believe all food and wine matching is nonsense, please do tell me how fabulous you think a glass of young, tannic Médoc is with a piece of salty Roquefort. The truth, of course, lies somewhere in the middle. It has nothing to do with colour and everything to do with chemistry. And how sensitive our palates are to certain flavours. Winemaker Neil McGuigan and chef John Torode have recognised this with their recently-launched Recipe Collection. There are three choices of wine for each recipe. I took part in a more extreme version at this year’s annual Koshu of Japan (KOJ) Tasting. OK, “extreme” may be over-egging it a bit. But the idea was to show the restaurant trade (KOJ’s primary target) how versatile this subtle, lightly aromatic Koshu wine could be, beyond the usual matches of sushi and sashimi. “It’s terribly easy for a wine culture to be bogged down with what they [the producers] eat at home,” said wine critic Charles Metcalfe, one of the hosts at the wine and food matching session at The Westbury Hotel. 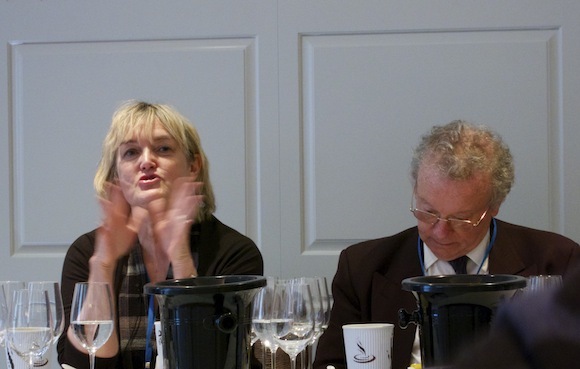 Joining him were Guardian wine writer Fiona Beckett, who also specialises in food and wine matching (a site I use a lot), Patrick Schmitt, editor of The Drinks Business magazine, sommelier and Koshu promoter Yuka Ogasawara and Lynne Sherriff MW, who consults for KOJ. Lynne explained that the idea was to do something different and also have a bit of fun, which was possible because of the “interesting” taste spectrum these wines have from white peach, Japanese citrus fruits to soy sauce – plus the use by some producers of oak, and sitting the wines on its lees. There’s sparkling Koshu too. One wine from each of the 12 Koshu producers at the event was showcased and we tasted six dishes altogether, grouped into two. 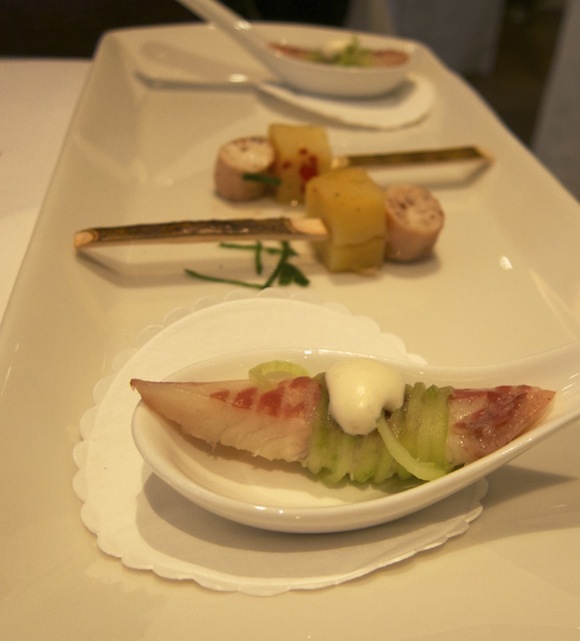 The first pair of dishes felt Japanese influenced : smoked eel with fresh cucumber spaghetti and horseradish cream and octopus and potato skewer with pomegranate and red chilli dressing, which turned out to be a bit stodgy and vinegary and clashed horribly with the Alps Winery Koshu 2011. The fruitier Rubaiyat Koshu 2011 fared the best, but only just. All went with the eel, which was my dish of the tasting. A fantastic combination of textures and flavours. 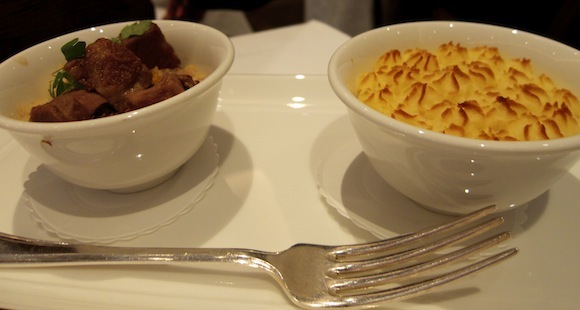 The next pair of dishes contained the biggest surprise: along with the creamy, comforting Westbury fish pie (which went with all four wines served alongside) was a navarin of lamb with aromatic, fruity couscous. The Aruga Koshu Katsunuma 2012 was the most intriguing, highlighting the fennel spicing in the couscous. The peach flavours in the Haramo Koshu 2012 worked with the apricots, and was just about weighty enough for the meat. Quite a revelation, though as Fiona seemed to suggest, pairing white wine with red meat could still be a hard sell in a restaurant. There were appeared to be pretty robust flavourings in the descriptions of the final two dishes: marinated salmon with honey, soy and Tuscan spices (a mixture of Italian herbs it seems) and duck and hoisin sauce in a light wrap. Yet, there was at least one wine which worked for each because, as it turned out, there was lightness of touch with the food. “A dish that might not have worked did for me, because of the delicate handling of the dish,” commented Fiona on the salmon. My top choice for the salmon was L’Orient 2011 and for the duck, Suntory 2012, because of its structure and its ability to enhance the sweetness in the sauce, not fight it. 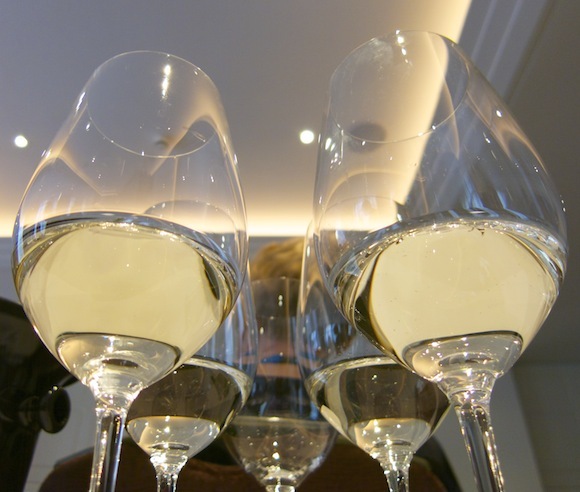 The purpose of the exercise was to encourage more high-end restaurants to stock premium-priced Koshu and to open their minds as to how they could serve it. 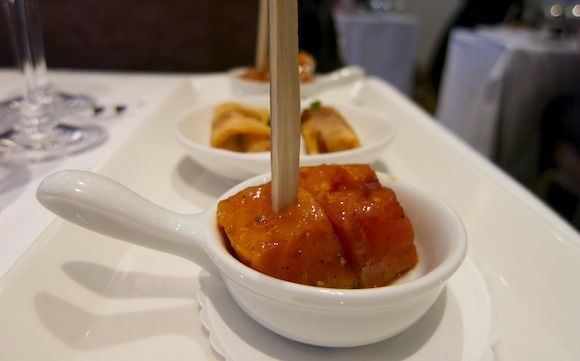 For me, it proved (again) how irrelevant some food and wine matching “rules” can be. But also (as in the case of the vinegary octopus) how some combinations will never work. No matter how much you want them to.